With a sigh, I plopped down in 14F. Even the short walk through L6 was hurting my feet, but now they could finally relax for a while. A comfy, starboard seat and a brief flight were all that separated me from long-awaited idleness. The plane wasn’t terribly full, and I wondered if I’d have another friendly passenger for the ride home. Truth be told, I’m pretty sure air travelers come in two non-exclusive breeds: talkers and non-talkers. Non-talkers slap their headphones and/or sleep masks on the moment they’re settled on the plane, and I get that; everyone comes from somewhere, and you don’t know how stressful or eventful their day’s been. Maybe this is the only chance they get to chill out and veg. While I’m fine with not talking to my neighbor, I welcome chitchat. I had a lovely conversation with my seatmate on the way back from Washington, D.C. last year, and it’s always fun to hear where your neighbor’s off to. As the cabin door slammed shut, though, I was given neither. 14D sat empty beside me, and that’s fine too. Last year, my round-the-world trek to Asia took me on six 1,000+ mile flights, and on four out of the six flights I didn’t have a direct neighbor. For the two transoceanic flights I had, this was an enormous blessing. 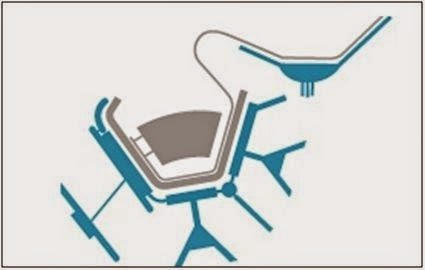 I like idle banter, but I probably like an empty seat more. With nothing inside to draw my attention, I turned to the window. That Iberia flight’s still waiting for a pushback. Next to such a massive plane, our little Embraer 175 felt pretty unimportant. We were on a short hold before pushing back ourselves, likely for the big A330 next door. Picture doesn’t do it must justice; it’s a big one. Shortly after it pushed back, an Alaska Airlines flight taxied into L8. Might be the only major airline that still holds a state’s name. When I was in Portland last year, I saw a ton of Alaska flights, many of which were likely zipping off to Seattle instead of its namesake. This one probably came from Seattle, too. We got the green light from ATC to push back, so we rolled back slowly and hooked a right onto the taxiway. Down we rolled as the engines spun up from idle. We were a little fish in a big pond, that’s for sure. Nice to know, though, that a little regional connector still has a place in line at one of the world’s busiest airports. We passed another terminal than curved onto the taxiway to take us to our runway, 22L. About eleven minutes after our pushback, our Embraer hooked onto 22L, facing southwest, and the engines launched us forward. The climb was clean, and what a view! I’d planned this, facing the sunset and all, but this was a way better view than I was hoping for. As we went further south and further up, the sky only got clearer and the colors of the sunset more pronounced. The fasten seatbelt sign dinged, and the non-turbulent flight leveled off a few minutes later. I pulled out my notebook to take note of the day and jot some notes. My UP band still clutched my wrist, but I’d wait until the absolute last minute to count and log my steps. My phone, which had a bit of battery left after its brief charge forty-five minutes earlier, entertained me for the rest of the way. It got close to nine o’clock and, much to my surprise, it was still a bit light out. Ten minutes later, the last rays of the sun still clung to the horizon. When I was a kid, I remember going out at the longest day of the year, around June 21st, watching the sunset, and noting the time. This was in Louisville, so I clocked the sun setting about 9:30, with what I perceived to be the last light of the day disappearing shortly before 10. Here we are, though, three months before that, and our high-altitude position and extreme western location in our time zone kept it light after 9:00, something I thought was unheard of before May. Small thing, I guess, but I kind of enjoy being proven wrong. If you’re proven wrong, you learn. Right before the hour, our captain advised us that our descent had begun, and we could feel and see it as the lights of the ground grew closer. I’d flown this a dozen times on my flight simulator at home, but I was still lost on how and from what direction we were approaching, though I assumed we’d land on the opposite runway and in the opposite direction from the way we took off this morning. This’d put us on 17L, the shorter of SDF’s two main runways. This runway, and particularly this approach, sidles right next to the cell phone lot, and I’ll often go to the lot during my downtime and observe the planes that fly in. On a night as nice and clear as this one, I might see myself snapping long-exposure shots from the parking lot below as we cruise in for a landing. As a way to mirror this pastime, I prepped my phone to take my fourth and final aircraft movement of the day. We crossed over the Watterson Expressway, just a couple hundred feet above the highway when I hit record. Because it was dark, however, my phone could not adjust to the low light without using an irritating flash. By the time I’d turned off the flash, our extended gear hit the tarmac and the reverse thrusters were already engaged. Frustrated, I stuffed my phone back in my pocket and prepared to deplane. We’d landed almost fifteen minutes ahead of schedule. While O’Hare would still be bustling in the mid-evening, SDF was pretty quiet. We docked and deplaned without issue. Down the jetway we go! Welcome back, more like; I’d walked down a jetway here heading the other direction about 15 hours ago, but as I’m not used to being gone for such a short time, seeing that seen still offered the same “I’m home” relief as any long journey would. American uses the end-cap gate, and we emerged from there, right near where I’d gotten on a B737 earlier that morning. It and every gate had all but closed for the evening. Louisville’s last outbound flight usually leaves the gate no later than around 8:30 PM, so Louisville was only a destination for the rest of the night. I followed the rest of the crowd, which made a beeline down Concourse B towards the baggage claim and the exit. The lights were off, the barricades were lowered, and the majority of the airport had fallen back asleep, ready to wake up early the following day. The moving sidewalks still work long into the night, and I hitched a ride, grateful to not be lugging a heavy suitcase or bag that might make me trip on the other side. “Hi, Jack,” I muttered as the familiar voice repeated its warning overhead. While my feet had enjoyed a brief respite, they started getting sore again as I walked past the dormant TSA scanners. Once I got landside, I saw the flight’s passengers disperse to the baggage claim carousel. For those of you who like to check a bag, I challenge you to try your next vacation without doing it. Having to hope and pray it’s there can be harrowing. You might think it’s tricky, but I hadn’t checked a bag on a solo trip in my life until my trip to Asia last year, and then only because I had to bring a suit for MBA-related events. And hey, most everywhere charges you for a bag these days, so it’ll save you some dough, too! I made my way down the western escalator and into the parking garage, where the cold outside air slammed into me after emerging from the airlock at the far end of the tunnel. The parking garage looked pretty cool in the dark, and it’s always matched up with the aesthetic that I associate with the airport, so I never mind walking through it. There y’are! Not the best parking job to show off, but hey, it was a quarter to five when I did it. I popped the door open, tossed my camera bag into the passenger seat, slammed the door, and just sat there for a minute. I watched my breath float through the undisturbed air in the car. I reached in my wallet for a ten-spot to pay for my parking, fired up the old Bug, and tootled up to the exit, bill in hand. With a smile and a thank you, I took my dollar change and swung over to grab a bite to eat before heading home. After getting home and giving myself a chance to eat and recover, I plugged in my UP band to see how well I’d done. Thirty-three miles! That’s a marathon and a quarter! That’s walking to Scottsburg, Indiana from my house! Although I tried to remember a day, I’m not sure I’ve ever walked that much in one 24-hour period in my life. And without a doubt, I’d never had that much fun walking as long a distance. I’d always considered thirty miles a person’s maximum to walk during a day, but this had that beat! It was fun to look at the UP graph readout; you could tell the lulls I had in the day; the first one was the first flight, the second dip was my bus ride, the third break was my CTA ride to O’Hare, and the last one was my inbound flight back, with the final burst being the return to my car. I weighed myself and I’d lost four pounds since the day before. My thighs had swollen where they’d slammed into each other 60,000 times. 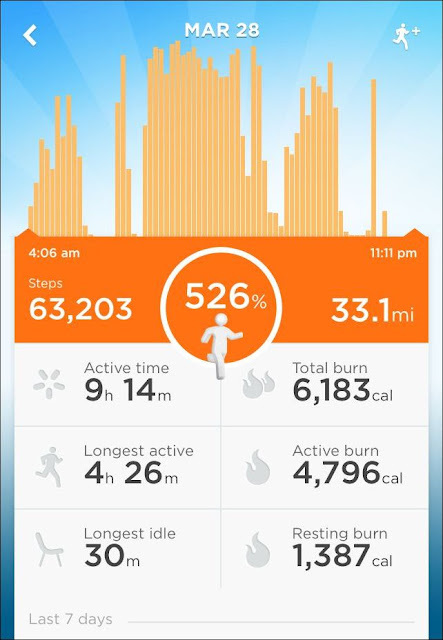 My feet were pulsing, even the next morning and Monday when I went back to work. I’d be out of commission for a few days, but it was worth it. This was a real accomplishment for me; I’m not in awesome shape, so this proved that anyone with the drive to walk thirty-three miles can well enough do it. Get some comfortable shoes, stretch, and wear some Spanx to prevent thigh chaffing, and the world is your running track. The walk proved to be an amazing experience, and I learned a ton about traveling today. I was blessed with exceptional luck, timely arrivals, and beautiful, albeit cold, weather. There were so many things that could have gone wrong, but none of them did. Everything was on-time, everything was where it was supposed to be, and any error during the day was my own fault, and I can fix those things. Overall, I could think of three things I would change for my future walks based on this experience. 1. I needed a backpack. Although I didn’t mention it much, I had to stuff a bunch of stuff in the camera bag, and having even just a cloth pack on my back would have made it easier. Moreover, carrying large weights on one shoulder meant that I had the side my camera rested on a lot. Carrying a backpack distributes the weight and frees up my hands so I don’t have to juggle multiple things while I extract my camera. Most airlines these days permit you a carry-on, which could be the backpack, and a small personal item, a designation that the camera bag fits. 2. The walk was a bit too ambitious. It was fun, don’t get me wrong, but it was a hard walk. Looking back on how much I walked, I’d already walked twenty-four miles before I ever set foot in O’Hare, so planning to add another several miles (7.6 to be exact, I calculated it later), was really taxing on my body and mainly my feet. When every step hurts, it’s hard for the excitement of the trip to sustain you, and your internal monologue changes from “let’s explore every nook and cranny!” to “how far away is the nearest bench?” The fact that both Chicago at large and the airport walks were all exceedingly flat probably deserves a large amount of credit for my ability to withstand the pace and distance of the walk. If I’d done it again, knowing I had fourteen miles of airport to walk, I would have revised the non-airport walk down or prioritized my airport walking to not being so taxing. 3. Turn-by-turn directions are not advisable or helpful. I should have learned this months ago, but traditional directions are often harder to follow in practice than they are as I comfortably browse Google Maps from my desktop. Instead, I think waypoints are a better way to go. If I know my mark is on such and such street at such and such a distance, I can take any number of routes to get there without having to worry about missing a turn. Then I’m looking at the directions less, but I’m also more free to wander down an alley without feeling the need to backtrack to stay on the planned route. I still end up taking detours, but not having to rework the plan on the fly would be nice, and some of the best things I find on a trip are things I don’t expect. To fully commit to the spontaneous Miles by Foot experience, this is a necessary step to take. All that being said, there were three things that this walk positively proved. 1. Planning ahead and using public transit efficiently really helped. A person who plans has two fears: their plan won’t work or their plan will be obsolete or pointless. In this case, both went right and I was rewarded for hours of research, mapping, and careful timing. I was never stressed about schedule, but I didn’t have tons of idling, either. My day was well thought out, and it paid out for my time’s investment. 2. 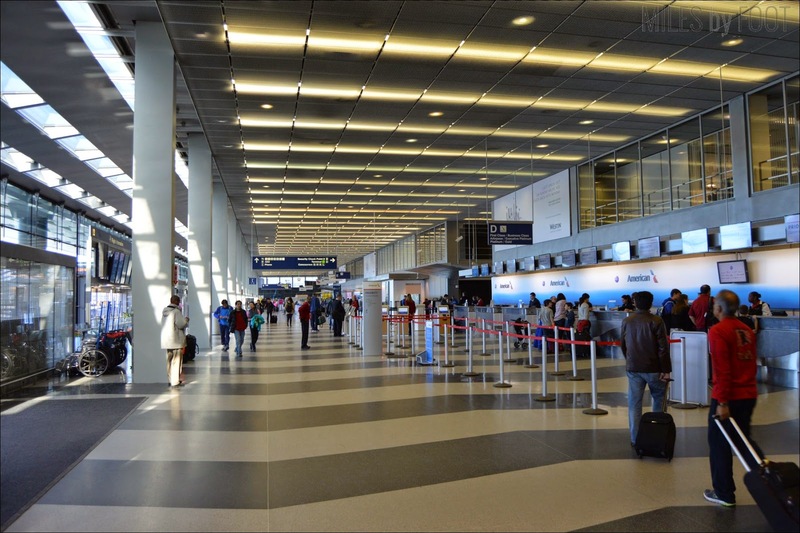 Walking the airports was directly correlated with the positive travel experience. While most people think that the idea of walking an airport ranges from unnecessary to an affront to the travel experience, it was essential to providing the fun, jetsetting feel we all want when we transit by air. Even though I was taking Louisville’s shortest, cheapest flight, exploring the airports truly completed the experience. I put down just as many miles outside of an airport as within one, and I wouldn’t change the balance at all, despite the strain it put on my feet. Assessing the right distance is one thing, but including the exploration of your airport as part of the journey is a necessary and fulfilling part of the trip. 3. Overwhelmingly, this travel format works. If you’ve just got a day and you want to see as much of a city as you can, this is the best way to do it. You’re going to have a busy day and you will be tired at the end of it, but because we all have lives with family, work, and our other interests, being able to take a one-day excursion works logistically, provides an excellent opportunity to explore somewhere new, and it exercises your body and mind in a healthy, fulfilling way. Having succeeded at the first full-fledged, non-concessionary attempt at this kind of travel experience, I can safely say that this is by far the most enjoyable way I’ve ever employed to explore a city in such a short period of time. You get the full picture, even if it just seems like a snapshot on the outside. One other benefit of this way to travel? It’s cheap! Here were my total expenses. That’s a day’s trip, including a commercial flight, for under $200. It’s amazing how inexpensive a trip can be when you’re not getting a rental car, a hotel, or pricey meals. Clearly the flight is the largest chunk of the trip. However, driving the six-hundred-mile round trip in my Volkswagen would have cost roughly $80.00 when you consider both car use and gas. As you probably don’t want to walk thirty-three miles and drive ten to twelve hours in one day, you’ll likely also need a hotel, which will raise the costs to rival or even surpass that of a cheap flight, so bear that in mind. Chilly Chicago provided a great trip, complete with both expected and unexpected sights, sounds, and tastes. Mission accomplished! As any traveler will tell you, though, our eyes are always on the horizon for our next trip. Where will our feet take us next? Today had already surpassed every expectation I’d had for a successful walk: lots of great pictures, an invigorating physical journey, and plenty of interesting and unique experiences. Now, though, it was time for the crème de la crème: Chicago O’Hare International Airport. It might seem silly to look forward to an extended stint at an airport, but I want to share why airports can be secretly awesome parts of any trip you take. Airports are, in no small terms, doorways to the world. Never in human history have we been able to say that we can travel from one side of a country to the other later in the same day. In fact, we can be in any part of the world in twenty-four hours. The places that take us there are airports, huge museums dedicated to this amazing scientific, economic, and engineering accomplishment. Every airport in the world has just a short window of time to impress you while you’re there; you can see all kinds of people doing all kinds of things in all sorts of places at all different times in their lives. Airports offer an opportunity to see other people in their most momentous times. These people are off to make big sales, big memories, or big changes. You get the chance to see that, see the miracle of flight, and everything that the world offers all for the price of a plane ticket. Can’t wait, right? Thought so! While planning this trip, I made detailed plans to make sure I could see all of O’Hare, and after trying to hammer out the logistics of transit and flight times, one thing quickly became clear. 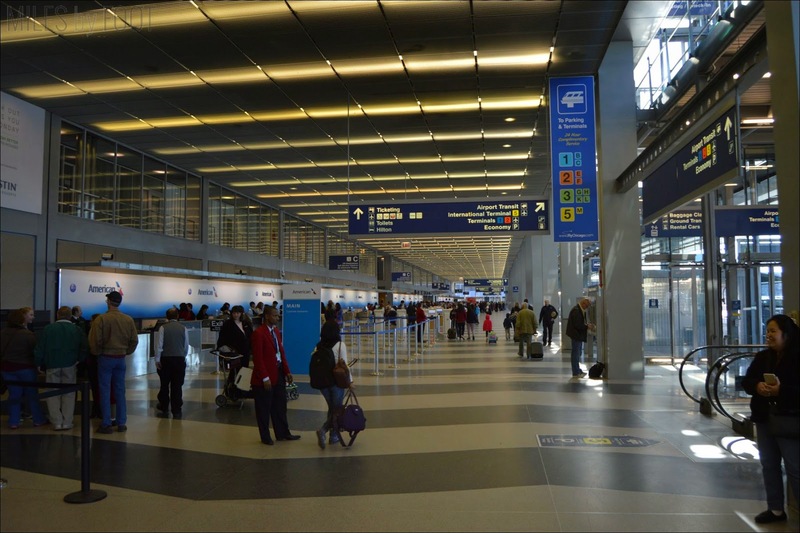 O’Hare has continuously ranked among the largest and busiest airports in the world, claiming the top spot during the 1990s, and it currently has more takeoffs and landings than any other airport on Earth. With a whopping eight runways, you’re looking at a takeoff or landing every thirty-five seconds. Over the past twelve hours, I’d seen a small airport, my own in Louisville, and a medium airport when I flew into Midway. O’Hare, however, was a whole different animal; instead of the typical one or two concourses to explore, Chicago O’Hare has nine. Whenever I’m going to any large airport, particularly one I hadn’t been to before, I like to allow a minimum three hours to explore it, and in order for me to do that here, when my city walk was already so ambitious, I had to carefully and minutely orchestrate the entire trip to allow enough time to see everything both within the city and within each airport. Midway was a breeze at thirty minutes, but even that was plotted out to the minute, and I still missed a little bit. A lot of things had to go right, but here I was, walking up the escalator at four o’clock sharp, the exact moment I was supposed to arrive. My flight departs at 7:15, and I’ve got to be there at least fifteen minutes before that to get on. I was flying back on American this time, so I wouldn’t need to be there early enough to ensure a good seat. With nine concourses and only three hours to see it all, I was on the clock. 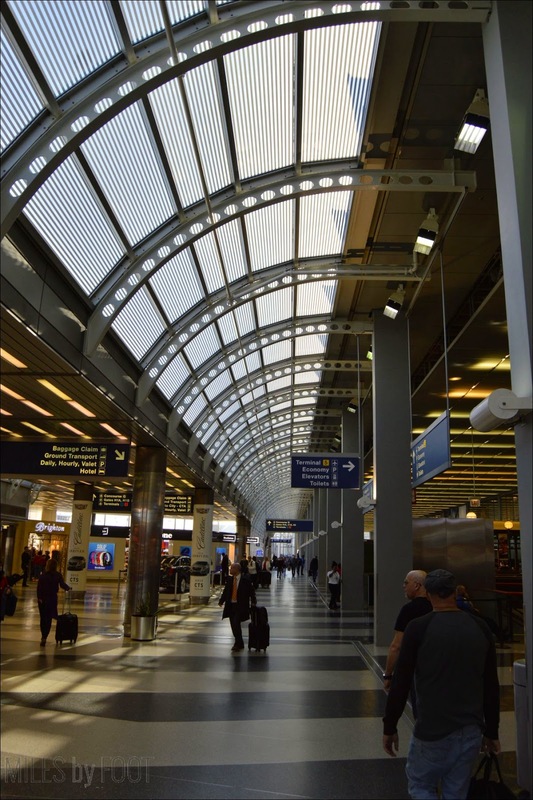 O’Hare’s nine concourses are sorted into four large terminals, and both the terminal and concourse sequencing is suspect at best. Terminals 1, 2, and 3 mark the left, bottom, and right part of that hexagonal semi-circle, respectively. Terminal 5, which apparently ate Terminal 4 during a land dispute, is the stand-alone terminal at the top right of the picture. The thick gray block marks a parking garage, and the thicker gray band representes the large landside terminal building. The thin gray band marks the airport’s people mover, strangely on the landside of things as well. This was my first stop, as Terminal 5 would be where I’d start my last walk. Terminal 5 is O’Hare’s international terminal or, rather, it’s where international carriers fly into, and that distinction will come up later. It’s completely separated from the rest of the airport, so I figured I’d start at the outskirts and work my way in. The fact that it’s separated provides a challenge. Before 9/11, you could go all the way to the gate without a boarding pass; if you weren’t flying, you could go through security and wander back to the gate to see your loved one disembark. I remember doing this countless times when Mom would fly home. You can’t do that anymore, and because the international terminal is separated, I would likely need an international airline’s boarding pass to actually explore that terminal to any length. “Likely” being the operative word. I’d brought my money belt, which contained my passport, wondering if I presented it to a TSA agent with a valid boarding pass, even a non-international one, I could get into the terminal long enough to walk it. Then I’d head back to the main airport and clear security again. Well, that was the plan. I rode the people mover from Terminals 1, then 2, then 3. Then there was a long expanse as it wiggled above the track to the next one. A family was riding in the same car as me; a mother, a father, two daughters and a teenage son off somewhere fun, I’m sure. We got to the large, new terminal and disembarked. I walked into the landside terminal and tried to get my bearings. Plain, but big. The flags, potentially of all the nations represented by their national carriers, flew on the walls behind hundreds of passengers in line to check their bags. There were many more counters than there were flights today, but the big destinations today seemed to be Dublin on Aer Lingus and, as you see here, Dubai on Emirates. If you’ve never flown Emirates, you’ve gotta do it. Took a flight onboard one of their 777s last year from Colombo, Sri Lanka to Dubai and it was the nicest flight in coach I think I’ve ever had. Dubai is another behemoth of an airport, but when I was there, I only saw a small piece of one part of it. Maybe one day I’ll get back there and walk the whole thing, too. The Dublin flight’s passenger had a younger median age. Lots of kids flying to visit, and even a few flying home, as revealed by the lilt of their Irish brogue. Never been to Ireland but, as with most places, I’d love to go someday. I went to the middle of the terminal and peered towards the security line where two no-nonsense guards stood. Suddenly, standing here with my passport pressed up against my stomach next to an incompatible boarding pass, I chickened out. Eh, it’d be OK. I had lots of O’Hare to see. I made my way back to the people mover, which’d take me back to terminal 1, where I’d continue my walk. Best guess put my flight in Terminal 3, so I’d slowly wiggle my way there from the first terminal. I looked at the provided terminal map on the people mover, clutching a pole as the train started to move. Uh oh; maybe none of the terminals were connected and I’d be consigned to just one for the entire two hours and forty minutes I had left. Oh boy, I hope not. I got a sinking feeling in my stomach; had I made a critical error? I turned to an airport employee and asked if the terminals were connected airside. “American is terminal three, you’ll get off right here.” She gestured with her hand as the train braked, and I followed her off. Didn’t really matter where I went through security if the terminals were connected, right? At this point, I had to assume that they were. The biggest airport in the world wouldn’t make you clear security just to change airlines, would they? I jumped in line, stowed my camera, and went through security. They caught something on the body scanner, but it turned out to be my money belt, which held my idle passport and some extra cash. I got scolded for forgetting to take it off. I slid my sneakers back onto my sore feet and put in my headphones, hoping I would round the corner and find a path that would lead to Terminal 1, where I’d planned to start my walk. Thank goodness, I get to walk after all! Said no one else ever. First things first; I was thirsty, and with another two-ish hour walk ahead of me, I’d need a beverage. Looks like it’d be a three-dollar blue Powerade at one of the newsstand outlets. I guzzled that down and started making my way to the first terminal. Unlike somewhere like Atlanta where most of the terminals look the same, O’Hare’s terminals and concourses all look a bit different, being built at different times for different purposes. I entered a hallway and emerged in this rotunda. Down the hall behind me lay a concourse I’d get to eventually, but for now, I had to keep walking to my start point. Another small hallway and this great long terminal stretched before me. The map did not prepare me for this kind of distance. This square building had huge windows on the left for watching planes across the expansive airfield. With as frequent as delays seemed to be, that might afford an unwilling passenger a bit of respite. Ehh, I guess I can take a look. As indicated by the liveries and variety of planes present, O’Hare is the primary hub for United Airlines. I’ve flown on United maybe twice in my life, always preferring American, Delta, or Southwest. Before it merged with Continental, I flew them on occasion, including across the pond to the UK once. This wasn’t our stop at the moment, though. One more terminal to hop, skip, and jump to. A hooked hallway led us in a roundabout way to the first terminal. The corridor was lined with artistic renditions of Chicago, some by professional artists and some by the city’s youth. At the end of the corridor, our path chicaned by an exit to baggage claim and a security lane. I walked under a sign pointing to B and C gates and I was in my first stop. Yep, B was my first concourse. Where is Concourse A, you might ask? If I had my guess, it was probably torn down to make way for the current terminal, and the subsequent concourses B and C followed that same ordinal sequence. Concourse B was buzzing with people. As a dedicated United terminal, this made a lot of sense. O’Hare is known for its tight connections, and I bet most people here were trying to make those connections. Airports catch people in a variety of states: some are running headlong down the terminal to make a connection that was much slimmer than they anticipated, and others are casually relaxing, waiting in line for a latté or reclining at their gate, covering several chairs. Unlike at, say, a sports game, everyone’s not going the same place at the same speed, so you see this dichotomy in a way most other forms of transport don’t allow. Concourse B is a straight rod of a concourse, so I walked to one end to start my walk past every gate in the airport. The combination of perforated metal supports and glass panes made this concourse feel like a futuristic, but somehow still oppressive warehouse. The dome shapes at each end made it all the more fantastical. I wasn’t more than five gates into my walk that I really realized how fiercely my feet hurt. I was unconsciously favoring my left leg with nearly every step and my calves ached. Still, I wasn’t going to be here again any time soon, most likely, so I really wanted to push through it. This gaggle of Germans and Americans was headed off to Frankfurt. It was about five, meaning they’d take off around six, putting them in Germany shortly after sunrise. Redeyes are always nice because you basically just get a rough night’s sleep and you wake up in another country. Flying west long-distance is much weirder. On a flight to Tokyo last year, I flew out from Atlanta at around 2:00 PM and landed around 4:00 PM the next day, roughly following the sun the whole time. Flying east is easy. Concourse B was over in ten minutes, so at that pace, I’d be able to keep up with my schedule. To get to Concourse C, I had to go underground. Concourse C was separated from the rest of the terminal by an underground walkway. They didn’t want the transit to be boring, though; a stretch of oscillating neon lights coursed above the moving walkways. Instead of walking on them, I stood, giving my knees and feet a break. I removed my headphones and listened to the reverberation of sound repeating off the mirror-like walls. At the other side, an escalator lifted passengers to the middle of Concourse C.
Concourse C was like a mirrored version of Concourse B, with gates on both sides, wider walkways and a larger glass ceiling. Like before, I hooked a left and made my way to the end. The concourse was lined with food outlets and gates; nothing particularly unique about them, really, but the ceiling was pretty to look at. It was such a clear day out, I felt like I was seeing O’Hare at its best. Without much pause, I made my way to the southern end of the concourse, where I found myself in a stuffy, cramped seating area that served the five or six gates the capped the concourse. I sat, slinging my camera bag out front onto my lap. I sat listening for a moment as a United clerk called out for someone that was about to miss their flight to Munich, first in English, then in German. Once I felt I couldn’t dally anymore, I stood back up and marched towards the north end. Pretty sure this was a B777, and it was also making its way to a German city later that evening, Dusseldorf as I recall. B777s have some of the longest ranges of any two-engine plane, but for a widebody, they’re still smaller than a 747, an A340 or the mammoth A380. These things can fly a long way, though; longest flight I’ve ever been on was a 777. Was in the air for fourteen hours. At C11, a flight was getting ready to depart for Charles de Gaulle, Paris’s main airport. I lingered for the moment as the clerks made sure the passengers were correctly lined up to board the plane. I listened to see if I heard any French and, moreover, if I could understand any that I heard. I was a French minor in undergrad, and I like to see if I can still remember any of it when I get the chance. After straining to hear over the commotion for a few minutes, I didn’t here a bit of français, so I returned to my walk. I rounded the quiet northern corner, with large planes stationed at their gates without an indication of their destination and wheeled around. Two concourses down. While riding the walkway back to Concourse B, I checked FlightAware on my phone (which had five bars despite being thirty feet underground thanks to the replete cellphone mini-towers stashed around the airport, no doubt.) It appears that my flight was indeed slated to take off from Concourse L on the other side of the airport, so my strategy was good so far. In case you’re not like the rest of the world that has a cellphone that can tell them every city in the world’s time, you’ve got this! It still gives that old feeling of air travel, and how jetsetting is still a fun life to imagine. I turned down the narrow hall of Terminal 2 and walked down it a short ways. Now, while I don’t really have pictures of Terminal 2, I assure you that you aren’t missing much. This is the armpit of Chicago; tight corridors, old ceilings and tiles, outdated fixtures and a bizarre layout make it fairly forgettable. Concourse E (again, skipping D), houses Delta’s flights, while the adjacent Concourse F handles United Express, their regional affiliate that would fly you, say, to Louisville. The terminal was shaped like a Y, with each concourse branching off about halfway down with a common food area at the junction. Behind the food area, an empty hallway connected the two concourses, I guess for those unusual times where someone’s connecting from a flight from Grand Rapids via United to a Delta flight to Atlanta. I measured it, and it saves you about a hundred steps. While the concourse was unexciting, some nifty planes sat just outside the dark windows. No chance I’d seen any of these bad boys at home, so I gotta get my fill now. Terminal 3 was all that was left, but it still represented four more concourses. My feet were back to hurting, but I had to finish. I made my way out of the drab second terminal, hooked a right and proceeded back along the hub corridor. Before walking into the third terminal, I spotted the control tower reaching up overhead. I came to the entrance to Concourse G and turned right. There was a circular food hub, and the concourse itself jutted out from there. This was the first truly quiet terminal I’d found. The tall ceilings and low traffic levels let me hear my music, and it felt potentially the most airport-like of the concourses. It felt more open and inviting than any of the others, too. This one was a pleasure to traverse. I stopped about halfway down at a newsstand outlet and decided to get a souvenir for my wife: a mug with a vague, artsy likeness of the Chicago skyline painted on. It could be a sipping mug or a mug for paint, brushes, or makeup. She’s always got a use for little cups. The cashier tightly wrapped it in brown paper, wrapped another plastic bag around it and handed it to me. I slipped it into my camera case where my camera usually sat. Concourse G was mostly small American flights, much like the United Express concourse I just left. Today, though, only a handful of flights were arriving or departing from this concourse. Most people were off to the side in their seating areas, quietly reading or talking with a neighbor. It was nice. Back to the rotunda I’d walked through over an hour ago and right into the heart of Terminal 3. This – this is what I picture when I think of O’Hare. If you think about a movie shot in O’Hare, chances are this is the shot they’ll use. In my mind, this is a generic American airport. It was funny to see it in person again, as this is the only concourse I recall from the only visit to O’Hare I remember. Cutting through a busy crowd again, I found Concourse H.
Concourse H was dark, overhung by slowly changing colored ceiling lights. It was pretty cramped, too, but not unpleasant. My foot pain had abated, perhaps on the prospect of almost being finished, but I’ll take it. Looks like the fellow on the backpack was late for something. He galloped past me and everyone else trying to be the last person on his flight, most likely. Old American Airlines planes look so old compared to their new livery, the fresh, hip looking design you see on the A319 on the left. And look! You can see the city from here, right in the center of the photo. We’re about fifteen miles from downtown here, but on a clear day, you can just make out the skyline’s most prominent players. At the end of the concourse, I wheeled around in a small, open rotunda with several gates adjacent to it, and I made my way for the connector hallway that joined Concourses H and K.
This was a much brighter and friendlier version of what I saw between D and E. At the end of the corridor, I hooked a left to traverse my second-to-last concourse. This concourse was built much like H, with the dim, colored tiles across the ceiling. This was also an American Airlines concourse, so destinations included their own hubs: Dallas/Fort Worth, Charlotte, and Miami were all accounted for. Behind this 737, an unknown, large jet sat across the taxiway near the final concourse, L, where I’d be shortly. Hopefully it’d still be there shortly so I could see where that bird was flying. The end of this concourse also sported a rotunda and, tagging a pillar beside the open space, I turned around and returned to the junction. Back through the generic Chicago establishing shot, a quick right, and down to Concourse L. I walked past the security line I’d passed through earlier that afternoon and with about fifteen minutes before boarding, I hooked one last right to enter the concourse. This concourse had a unique combination of stylings, but the chromed metal was likely intended to match the old American Eagle livery, which flaunted the shiny aluminum exterior of their planes. Instead of regular gates, this concourse had subgates, where there’d be little alcoves and a couple gates in each alcove. I followed the straight concourse down to the end, where I’d seen the massive plan from the other side. Oh, Iberia! The plane was mainly off to Spain. The plane’s captain was prepping his flight paperwork, it looked like; with such a large plane and the fact that it sat so high, I was pretty much at eye level with him. Terminal 5 was within sight again; from here, you could see all the international flights lined up to go. The green one was Aer Lingus, potentially the same flight I saw others preparing for when I was still landside. The white cross is Swiss International, likely flying to Zurich, and the red tail with a circle in the middle of the frame is Turkish Air, almost certainly on its way to Istanbul, a ten-hour flight. Unlike the other concourses, this one was stunted, with just eleven gates along its length. With a few minutes remaining, I tarried at L10 as the Madrid passengers boarded, letting the last one get on before proceeding four gates to my own, L6B. There’s my city! They hadn’t started boarding yet and wouldn’t for at least twelve minutes. With my phone indicating a low battery again, I unplugged and stowed my headphones, retrieved my charger, and found an isolated seat at deserted L5. My feet still hurt, but the pain had moved up past my calves to my lower thighs. I guess that the longer you walk, the more the rest of your body unconsciously carries as you shift weight off the exhausted parts. It was a good burn, and having accomplished my walk successfully, I didn’t even mind the mile or so walk I’d have when I got home. My Jawbone step tracker, which had ridden my wrist through the whole journey, had likely stored quite a few steps. I was guessing around 50,000 steps but I was hoping for sixty. I was tempted to plug it in now, but my phone was charging, so I took the opportunity to just close my eyes and process the day’s walk, listening to the ambient machinations of the airport. About ten till seven, the desk clerk at L6 made the boarding call for American flight 4309 with service to Louisville. I slid my phone into my pocket, now just floating above 30%, and made my way to the gate. I presented my folded ticket with a smile and passed onto the jetway as my camera bag bouncing against my hip. I’d done it! I’d made the walk and gotten everything in that I wanted. What a day! The flight home and the return drive, along with a summary, will come to follow next week. Until then, keep going!